Due to complications at birth, I was born with only seven fingers and a shorter left arm. Though the Doctors said my arm would never really function properly, I never gave up. I knew at an early age I could not do some of the things other kids could do but I adapted to everything. I learned how to do change things so that I could do them as well. I played basketball, foursquare, and really learned to live with my condition. Later in life I needed a challenge, a challenge that would test my ability to adapt both physically and mentally. I set my mind on 3 things: Drumming, Break dancing, and fitness. I stuck a drumstick through a glove finger hole and got lessons. I learned quickly and played the next 4 years on my high school’s drum line, winning countless competitions. I also learned to break dance at U4ria dance studios. They took the time to help me modify ways to do moves and everything was great until I realized I needed to get stronger. That’s where fitness entered my life. My first day at the gym was like a 12 year old entering an executive stock market meeting- I had no clue what I was doing. All the machines were made for people with symmetrical limbs. I soon learned to adapt and use different fixtures to help me out. I really was working out hard until I discovered I had late onset type I diabetes. Undoubtedly one of the hardest adversities I had to deal with, diabetes was hard to control at first. I didn’t really know about nutrition or health in that area. I remembered a friend recommended me becoming a personal trainer and at that instant, I set a goal. I studied and studied until I passed my NASM exam. I changed my major to exercise science and have been fascinated by exercise and nutrition ever since. I’m proud to say I have showed people adversity can always be beaten. I adapt every day in order to live my life and I love showing people how to do the same thing. I can bench press 60lbs over my body weight, breakdance, and play drums better then most people who are “normal”. My passion is unmatched, my drive is unrivaled, and my motivation is looking in the mirror every day and not seeing a disability any more, rather an adaption that I have conquered! Life is all about adapting. Are you ready to Adapt? Hey, my name's Chris. I'm a certified personal trainer through the National Academy of Sports Medicine. I'm also in college for exercise physiology and health promotion. I was born with a physical disability and diagnosed with diabetes. I had to adapt to overcome my hardships and progress in life. 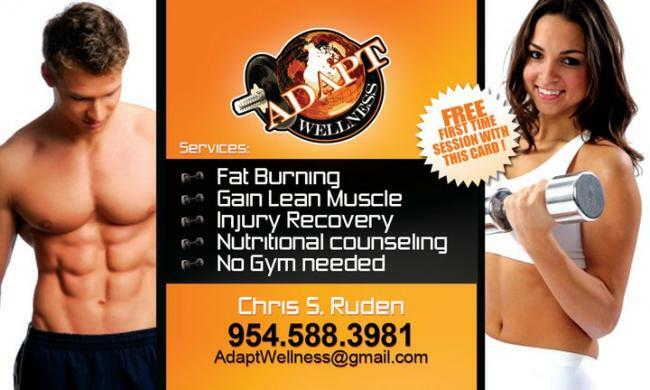 Adapt Wellness is a company I started and train under. My aim is to teach people how to adapt to their adversities and hardships to achieve a desired goal. Contact me if you would like to get healthy, sculpt your body, and be proud of how you look, function, and feel! I can help you overcome any hardship you have from over-weight to weight gain and chronic diseases( diabetes, CHF etc) to disabilities. **I CAN CHANGE YOUR FUTURE** Don't be embarrassed to contact me, or afraid you cant afford it.....YOU CAN'T AFFORD NOT TO!!! !